789 photos were used to make up our Thank You for Nursing in Public mosaic. Some photos are used multiple times for shading. Each photo is of a child nursing in a public setting that was sent to us by the child's mother. Several of the photos are included in the video below. Thank you for doing your part to bring awareness to the normal feeding of human babies. I vividly recall the first time anyone thanked me for nursing my child and commended me for breastfeeding on cue - in the midst of a busy, bustling Washington D.C. street. My son was seven months old and exclusively breastfed. He'd had a busy day as we were participating in the Genital Integrity Week March and Demonstration going on at the White House and the U.S. Capital. Marilyn Milos, founder of the National Organization of Circumcision Information Resource Centers, was also in D.C. for the event, and while we'd never before met in person, or talked for that matter, she took the time to step aside from the group when she saw my son and I sit down to nurse mid-march. Her words were like sunshine for my soul. I'd spent the first four months of my son's life mothering him solo as my husband was deployed overseas. I'd quit a professional career I loved to really be his mom. I was making attempts to heal from a very unwanted, traumatic birth experience, and to also mend physically from a horrific car accident that we were divinely blessed to live through. Brand new to the area, I knew very few people - no one, really. Yet within those seven months of challenges and upheaval, there was one constant: nursing my baby. It was something that also came with a rocky start, but not a life experience I was willing to fail at. Still, I'd never had anyone say "good job" up to that point. And so, Marilyn's sweet words flowed over me - washing away the doubts and fears left behind from the last time someone questioned, "When are you going to start giving him real food?" Everything she said was everything I needed to keep going - to hold my (often tired) head up high, wrap my son back up in his Moby, and continue on marching - both that day, and in life. Today my son is almost 2 years old. He still nurses on cue whenever, and wherever, he wishes. He truly is reaching his personal full potential - developmentally, intellectually, and in health. He and I owe a large part of our breastfeeding success to one wise woman who thanked us for nursing in public one afternoon, 17 months ago. Marilyn, I will never forget it. Please, the next time you see a mom nursing her baby - thank her! Let her know you appreciate her wise, devoted mothering, and that her baby is blessed to be in her care. Don't be afraid to simply say, "Good job!" 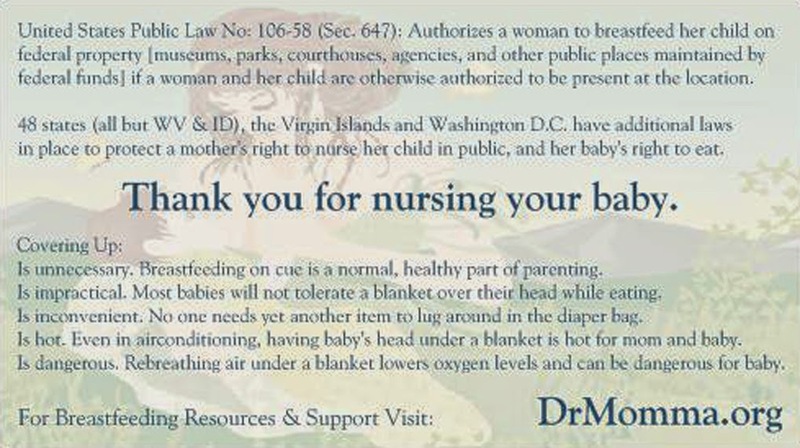 or hand her a little "Thank you for nursing in public" card with a smile. You never know how you may be impacting this momma's heart, and changing both her life, and her child's. For as prevalent as I know criticism of nursing is - I've never encountered negative words or even looks. My favorite moments are when I see a random middle aged man looking at me, and when I look up, he looks me in the eye and gives me a huge grin. It makes me smile. Beautiful! Thank you for compiling such wonderful pictures. Lovely video! I'm also one of those mothers who's been lucky to not receive any negativity while NIP. I loved this post! I wish I experienced a thank you when DD was younger. I love seeing Mums NIP. It normalises breastfeeding, and because I've been back in the workforce a few years & don't have friends with young children I no longer see babies being breastfed unless it's a mother nursing while out. It makes me long nostalgically for my own breastfeeding days - 3.5 years of it - and my breasts ache with the memories. They grow up so fast. Where are the kleenex?!? Beautifully said. The back side of these cards could have the same message in Spanish. Anon - that is a great idea! Thank you for suggesting it. Our next batch ordered will have the back in Spanish as well. This is a fantastic idea. I definitely admire all those who have given out cards! I am going to hopefully get myself some also to keep the chain going til everyone knows breastfeeding is the right choice and can be done anywhere! This is a beautiful post, and I'm happy to say that I've also received positive feedback while NIP, and it does help so much! An elderly lady stopped by while I was nursing my son in the mall and said, "that's right, you're giving him exactly what he needs!" and it really made my day. Little moments like that help to offset comments from well-meaning friends and relatives who push me to give my six-month-old more "real" food, tell me he must be hungry, and think that nursing should stop after 12 months. Is there a LOVE button?! :o) Because I do!! For a long time I felt such pressure to keep nursing in public (NIP) very brief or not at all...my husband was the worst, he kept thinking it was bothering other people so it bothered him - he would tell me to cover up because people didn't want to see that, eventually, with our 2nd son, I was strong enough and comfortable enough in who I am as a mom/woman/person to tell him that it was something HE was going to have to deal with. I nursed in public from then on but still always felt his pressure to hurry up...UNTIL we were at Red Lobster and my newborn started to cry and I nursed him, with glaring eyes from my husband, THEN an older woman, in her 60's, came up to our table and told me how wonderful it was that I was breastfeeding, especially in public, that she could look back on her experiences (of bottle-feeding) and see how important and natural breastfeeding-anytime, anywhere was! Women like her and YOU are making such a positive impact on the world! Little by little...for our little ones! Thank you! I am proud to say I NIP my 15 month old daughter!!!!! The collage is beautiful! My husband, one yr old daughter & I went to Rome for vacation. We toured St Peters Basilica & my daughter needed to nurse. I found a spot, out of the way of the tourists and sat down on the floor to nurse discreetly. The Italian guards came over to me & motioned for me to get up while saying something in Italian. I motioned that I was feeding my child. They were persistent & insistent that I get up. Apparently they don't allow sitting at St Peters, which I understand, but come on! I wasn't loitering, I was nursing my baby! So I stood and nursed her while standing. It wasnt ideal or comfortable, but her belly was filled. Later, I nursed her inside the Sistine Chapel while sitting between two foreign ladies who smiled at me like they understood how special that was to do, in that holy place. That experience made me think of Mary & what it was like for her to nurse Jesus. I wonder how long she nursed him. I wonder if we've made progress as a society as far as breastfeeding goes, or if we have regressed backwards. Fortunately, I haven't received any odd looks or discouragement while nursing my three children. I often get curious looks from toddlers and young kids. They adorably ask what I am doing, and I explain it to them simply. I think its important for everyone to see Mother Nature doin' her thing! 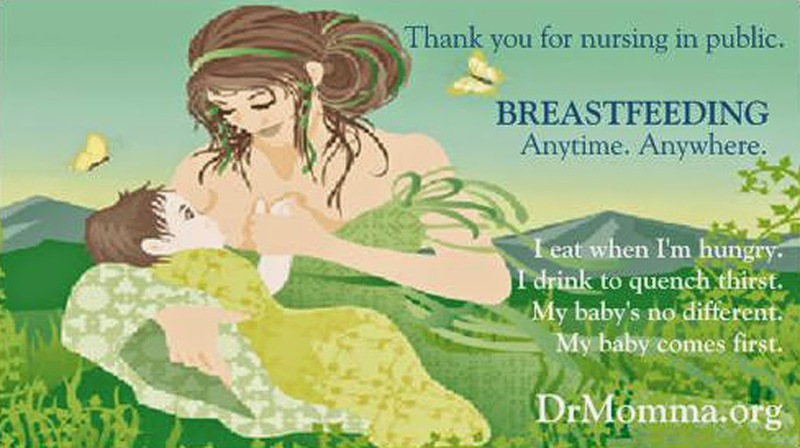 I love the idea of using cards to "thank" our fellow mothers for doing what is normal and natural. What a nice way to encourage each other!! I received one of these thank you cards while nursing at a park today. What a lovely experience!!! I had a nice chat with the mom (she had older girls now) about it. I posted on FB and got such great feedback. I came across this site looking for the image, so I can pay it forward. I will definitely be carrying this thank you cards to hand out myself! Brilliant idea!! !